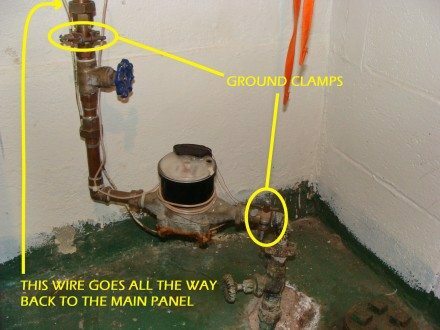 One of the most common electrical defects that I find while doing Truth-In-Sale of Housing evalutions in Minneapolis is a missing jumper wire at the water meter. This is a required repair item, and I often find the repair done improperly, so I’m writing this post to help anyone that has to fix this item. In Saint Paul, this item would also be written up as a hazard on a Truth-In-Sale of Housing evaluation. A) There must always be a jumper wire installed around the water meter. Bonding jumpers shall be of copper or other corrosion-resistant material, have approved clamping devices and be of the correct wire gauge for the service installed. If this jumper wire is not present or is not properly connected on either side of the water meter, (or only the street side, when the water pipes are Pex or similar materials) or is not installed with approved materials, mark as RRE. Be specific on what work is needed. A jumper wire is used to electrically bond the water distribution pipes throughout the house. Part of the reason that the water distribution piping in the home gets bonded is to make sure the pipes can’t accidentally become energized. 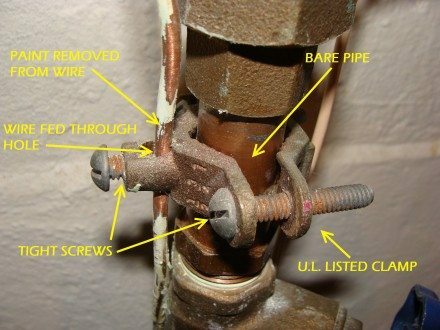 If an ungrounded (aka – hot) conductor came in contact with a properly bonded water pipe, the current would have such a good path back to the main panel that it would overload the circuit breaker and the breaker would quickly trip. In other words, it protects against electric shocks. Here’s a photo of what this looks like. The problem with this installation is that if the water piping gets disconnected, the electric panel is no longer grounded to the water piping. That’s why this installation is no longer acceptable. Many old homes in Minneapolis are still wired this way, so it’s especially important for the jumper wire to be present at these houses. If there is any other break in the water distribution pipes (ie – plastic water piping, plastic water filter, water softener, etc), there needs to be a jumper installed. For a blog specifically talking about this topic, check out Seattle Home Inspector Charles Buell’s blog on jumper wires. The photos below show what a proper jumper wire should look like. While some TISH evaluators require the bonding clamps to be placed on the outsides of the shutoff valves (vs right next to the meter), I don’t. This might be the preferred method, but that’s all – it’s not a requirement. As always, click the photos for a larger version. For more information on common Truth In Sale of Housing defects, click on any of the links below.